Turkey’s right to eliminate security threats it has been facing through cross-border military operations is conferred in the Article 51 of the UN Charter and in the relevant Security Council resolutions.The YPG poses a direct security threat against Turkey, which is not only an affiliate of the PKK terror group but it is also actively contributing to the PKK’s armed campaign against Turkey. The PKK is a Marxist-Leninist militant organization – listed as terrorist group by Turkey, the US, NATO and the EU – that seeks to impose its ideology on Turkey’s majority-Kurdish southeast. It is mainly supported by leftists including UK opposition Labour Party leader Jeremy Corbyn.On 8 December 2016, the PKK carried out a bomb attack outside a stadium in Istanbul. The attack left 47 people dead and 166 people injured. As for the suicide bomber, he turned out to be a YPG member who came from Syria. It was also revealed that the PKK has used the arms delivered to the YPG against Turkey. On 2 November 2017, the PKK killed eight Turkish soldiers in the Turkish border town Semdinli. It was revealed that PKK militants used AT-4 anti-tank missiles given to the YPG by the US for the anti-DAESH campaign.The YPG’s tunnels inside Turkey were discovered by the Turkish authorities in August 2017 between the Syrian border city Qamishli, which is under YPG control, and the Turkish border town Nusaybin. It is believed that the arms given to the YPG to fight DAESH were moved via these tunnels to carry out attacks in Turkey. Although some media outlets try to present the YPG as a democratic organization and YPG-held areas as “peaceful regions,” the YPG has a long track of human rights violations, from ethnic cleansing to using child soldiers to forced disappearance of its opponents.An Amnesty International Report (2015) states that “by deliberately demolishing civilian homes, in some cases razing and burning entire villages, displacing their inhabitants with no justifiable military grounds, (YPG) is abusing its authority and brazenly flouting international humanitarian law, in attacks that amount to war crimes.” The report mentions that in some cases, YPG militants threatened civilians with calling US airstrikes if they would not leave their villages.A Human Rights Watch Report (2015) states that the YPG regularly recruits child soldiers despite its promises to “follow up” such cases. Another Human Rights Watch Report accuses the PYD/YPG with arbitrary arrests, extrajudicial killings and, again, recruiting child soldiers. A recent footage shows YPG/SDF militants executing an unarmed civilian in Deir ez-Zor.On January 21, the YPG targeted two hospitals in Azaz in northern Syria that left at least one killed and 15 injured. Since the beginning of the Syrian Civil War, the YPG carried out similar attacks in which 407 civilians were killed, including 51 children. After Turkey launched the Operation Olive Branch, the YPG targeted civilian areas in Turkey with rocket shelling which caused the death of 7 civilians and left 113 injured. The YPG launched at least 98 rockets on urban areas in Turkey (namely Kilis, Reyhanli and Hatay) from January 21 until mid-February when they were finally driven back by the Turkish military to a distance they were not able to carry out missile attacks. On 18 March 2018, Afrin city center was captured and the military aims of the Operation Olive Branch were mostly achieved. With the Operation Olive Branch, an area of 1850 km2 alongside the Turkish border was cleared from the YPG and 3,991 terrorists were neutralized. 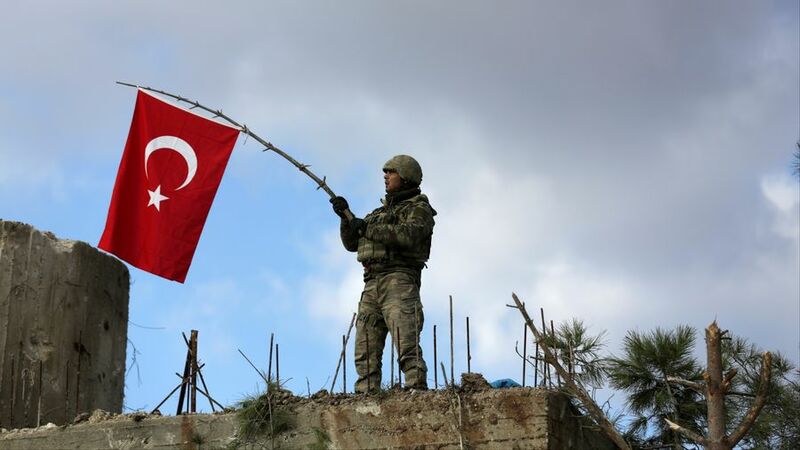 With the conclusion of the military phase of the operation, Turkey started to ensure the sustainable security and development of the region and well-being of its people. A local council consisted of 24 Kurds, eight Arabs and one representative each of Alevis, Yazidis and Turkmens were established.The council announced its aims as to ensure peace and security in Afrin, to collect weapons from civilians, to help electing a local assembly, to set up local law-and-order forces, to make all state organs functional, to ensure that education, health and justice will be properly administered, to provide compensation for victims of the latest violence, to respect women’s rights and to secure a free press and free speech. The council is formed with the prominent figures of the region such as Abdulazez Tammo, the brother of the Syrian Kurdish politician Mashal Tammo who was assassinated by the YPG in 2011. As the recovery process of the city continues, Turkey is now working to renovate schools in the province. Turkey have so far renovated six schools in Afrin.